story by Julie LorchStep one: Place local food activists, cycling enthusiasts and the rolling hills of Chester County into a pot. Two: Add a cup of glorious weather. Three: Sprinkle spandex to taste. Four: Bike 50 miles; immediately scarf lunch, turn in drink ticket for a Victory brew and voila! Bike Fresh Bike Local leaves you wondering if life could get any better. 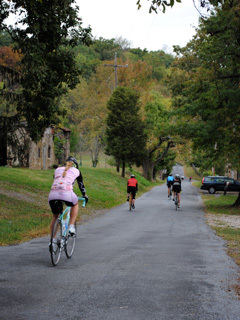 This year marked the third annual ride, a fundraiser for PASA (Pennsylvania Association for Sustainable Agriculture) and a celebration of local food and bicycling. On September 26, over 650 cyclists gathered to tackle 25, 50 or 75-mile loops, winding through quiet roads and serene farmland. Grid’s Managing Editor, Lee Stabert, joined me for the 50-mile option. Before the ride, we caught up with Marilyn Anthony, Southeast Regional Director of PASA and one of the ride organizers. Three years ago, Anthony dreamed of an event “that would engage the non-farming community, and put them in touch with beautiful farmland and foods from those farms, and with the work that PASA does to keep family farming in our region.” She mentioned her idea to two longtime local foods activists, Chef Royer Smith and Victory Brewing’s Bill Covaleski. As luck would have it, both were also bike lovers. The idea took off, with more and more cyclists saddling up every year. Of course, it makes perfect sense that Smith and Covaleski are avid cyclists—eating locally connects us to each other and to the earth, as does riding a bicycle. We become aware of the seasons, and are offered the opportunity to deepen our relationship with the natural world. Sometimes, we switch on the ability to be humbled by sensory experiences. If lucky, we are moved. There was little traffic, but we did pass tons of crickets, farm animals, spectacular open spaces and little white arrows marking the turns—no cue sheet fumbling required. And the roads! They were so well-paved they made Spruce and Pine feel like a couple of dodgy double tracks. It’s true that cyclists experience the world differently from drivers. We breathe more deeply and feel the texture of the road jangle our bodies; we see the sky and ridgelines unencumbered. Chester County, it turns out, is heaven. In keeping with PASA’s overall mission, food is at the center of Bike Fresh Bike Local. Returning to Victory after 55 miles of riding (yup, we missed a turn on the most well-marked route in history), we hobbled to the beer truck and pounded barbeque sandwiches made with local pork, slathered in slaw. For more on PASA’s events and initiatives, visit pasafarming.org.